“When I was about 13 or 14 I would ride with my dad, my uncle and friends on a Sunday morning and we’d sprint for the village signs. “I’d win a few…though I think sometimes my dad let me win.” It’s reassuring to know that such activities cross borders, that Sunday ride outs involve gallops for road signs, that dads let sons win and that even world class bike riders like Arnaud Demare started like everyone else – larking about on a Sunday morning. With an uncle who was also the President of the local club, Demare was surrounded by bike riders. It’s probably worth noting too that Demare’s dad raced at regional level and his mum was a French international, racing with Cecile Odin (looks like there might be something in those Demare genes…). Overall, there’s something reassuring about Demare – his progress from a six-year old rolling around on a mountain bike to 13-year-old demon village sign sprinter to FDJ.fr pro – partly down to the fact that his roots are firmly planted in club culture and habits. It was as a junior though, that Demare became aware that he had some talent. “I remember one of my first races with the French national team was at the Tour of Abitibi and I won my first race in national colours (he won two out of four stages in 2008 – Ed). 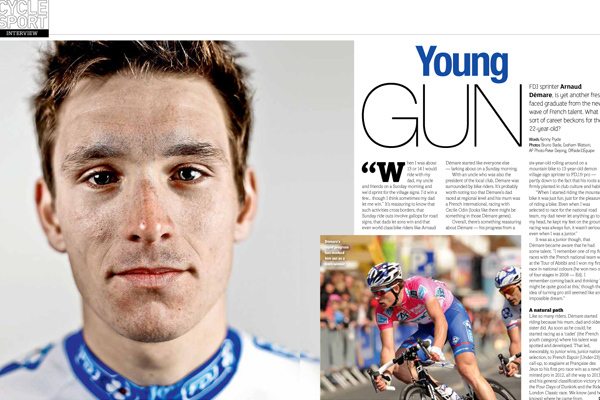 Read the full article in the December 2013 edition of Cycle Sport available on iTunes, Google play and all tablet devices.